Having played schoolboy football he joined Arsenal as an apprentice in 1982 and played centre forward and left wing. His first game in the first team was against Oxford United on16 November 1985 aged 19. It may be a reason for what happened latter, for Martin was one of those players introduced by one manager (Don Howe) but who then finds a new man in control – although at first he appeared to flourish under George Graham, taking over on the wing from Rix. In 1986/7 he became the top scorer for Arsenal with 24 goals in total – 12 of these were penalties. He was also in the team that beat Liverpool to win the League Cup in 1987. He also scored the first goal in the League Cup final the following season against Luton Town. Then it all seemed to go wrong. He became a regular substitute rather than a regular player – not least because of Brian Marwood’s arrival – but he was most notably on the pitch as a sub for the game against Liverpool in 1989. But there was something else about Martin Hayes – something in his personality. I recall one game – which I believe was against Leicester, at Highbury in April 1987 where he ran half the length of the pitch on his own to beat the keeper and score. It was a fabulous goal, but looking at the way Martin trudged back to his own half, without any goal celebration, it looked as if, for him, the whole thing was a frightful bore. He left us on 29 September 1990 to join Celtic for £650,000, which at the time seemed a rather large sum. He also won three England under 21 caps, including one in which he was called up as a very last minute replacement, as another member of the team was injured. He wasn’t even in the formal list of subs. Martin’s move to Celtic seems to have been a total disaster. Hayes only played seven times, and such was his decline in form he was loaned out twice, although again with getting many games, as can be seen from the table from Wikipedia reproduced above. His two seasons with Swansea were however better, as he won the Football League Trophy in 1994, before (presumably, but I can’t find any records) going to Cliftonville on loan. In 1999, after playing non-league football he became player manager of Bishop’s Stortford and stayed until November 2008. In February 2009 he joined Wingate & Finchley and then in June the following year he became manager of Dover Athletic guiding the club to its famous FA Cup run in which they reached the third round. However he left in 2011 after staying just one season as a result of a poor run at the start of the 2011/12 season. “I knew on Saturday night that things were not right, but I did not find out until I got a phone call on Monday morning. “The past couple of weeks have been very tough, but it has still come as a shock. You have to have the support of the chairman, and I feel I have, but also the supporters, and I don’t think I’ve had their backing. “We had 11 new players in the summer and systems and players take time to gel. If we’d lost six or seven games then fair enough, but we’ve lost twice. I would have liked the chance to see where we were at the end of the season and let people judge me on that. Since then I have lost track of him. If you know where he is, please do write in. 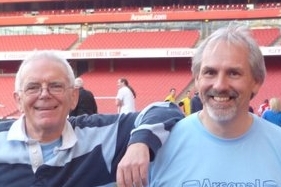 Hayes is doing commentary sometimes for ArsenalPlayer – I sit in the row behind the media gantry & often see him.